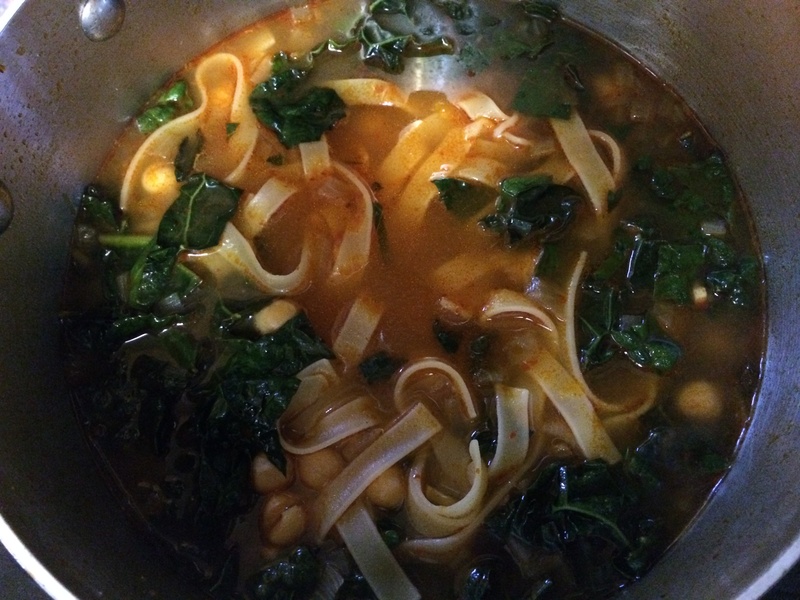 This recipe has languished for way too long without being written about, mostly because I didn’t take any decent pictures of it and it seemed like the one picture I had didn’t do justice to the complete awesomeness of the finished product. But finally, I have convinced myself that my poor photography skills should not prevent you from sharing in what is undoubtedly one of the most flavorful dishes you will make this week/month. I have always been a noodle fiend. 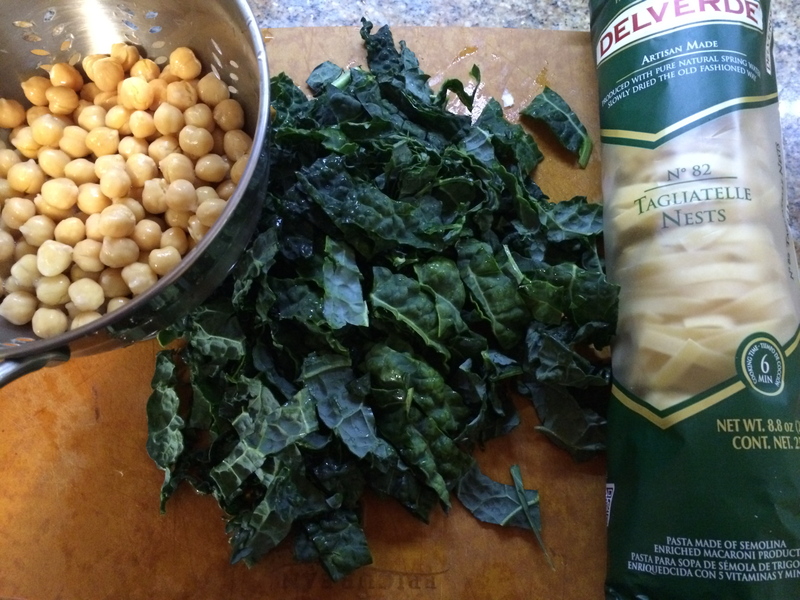 I’m not picky about their origin – Italian pasta worked just as well as Japanese yakisoba. But lately, I’ve found myself leaning more towards the Southeast Asian preparations. Malaysian, Singaporean, Indonesian and Burmese variations on noodle dishes are more interesting somehow, and just appeal more to my Indian love of spices than the cleaner (maybe purer) flavors of Japanese and Chinese noodles. They seem just familiar enough to the palate while still venturing out into unexpected territory. And on this hit list, mee goreng has been a much-loved favorite. The combination of heat, crunch and color excite my imagination and transport me to the abundant street stalls you find all over Asia. Each has its own specialty, and stumbling onto them feels like you’re in on a special secret only known to loyal locals. And now, with your entire kitchen smelling like heaven, you can feel like you’re in on the secret too. Set a wok or a large skillet on high heat. Once hot, add the oil and then the onion, and cook for about 1 minute to soften a bit. Add the tofu and French beans and cook for 2 to 3 minutes to give the tofu a bit of color. Stir gently as you cook. Next, add the boy choy. 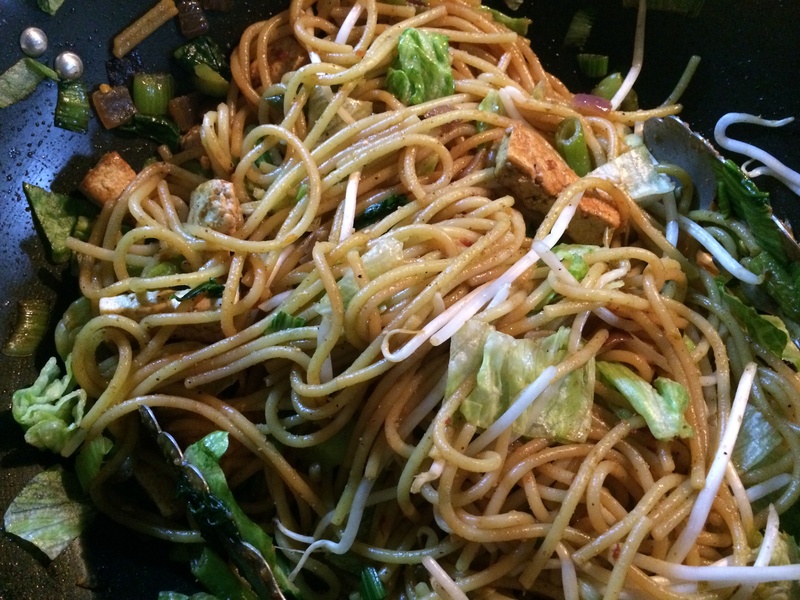 When it wilts, add the noodles and carefully spread them in the wok using tongs or large chopsticks. You want the noodles to get a lot of heat, almost to fry. Mix gently, cooking the noodles for about 2 minutes. Now add the spices, sambal oelek, soy sauce, water and bean sprouts and toss carefully. Cook for about a minute, or until the noodles are semisoft. When ready, divide between serving bowls, top with lettuce, and sprinkle with crisp shallots. Serve with lemon wedges and extra sambal oelek. I thought of saying something dramatic like “I’m baaaack!”, and then it struck me that there are 2.5 people actually reading this blog (oh, hi mom! ), and they probably didn’t realize I was gone anyway. So, scratch that beginning and let’s try again. 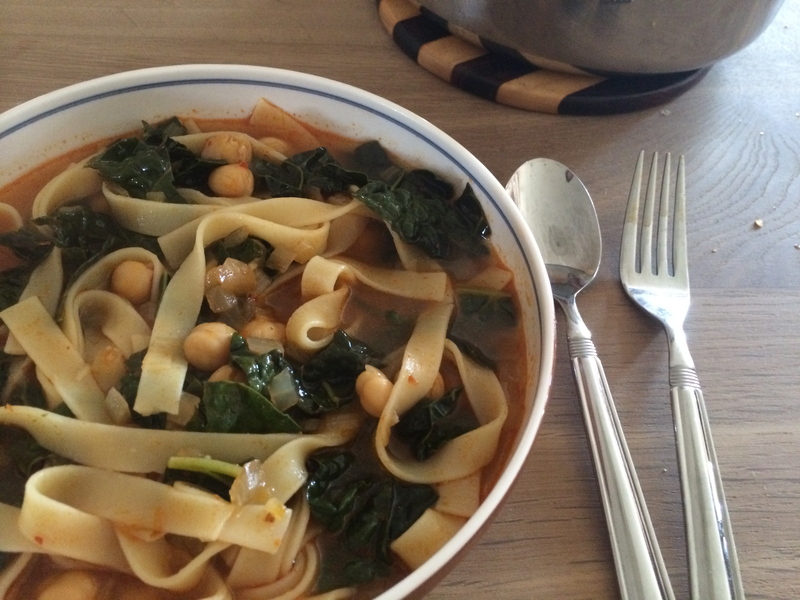 I think of this recipe as a survival mode meal. As in, it’s so good but requires so little cooking that you barely feel like you’re cooking at all, and the final dish has the most beautifully well-rounded flavor. Which is exactly what I have needed in the last few weeks as I unpack and try to get back to some semblance of a normal routine with my son, who has suddenly become a (gulp!) toddler overnight. Most of the wow factor here comes from a kickass vinaigrette that combines ginger, sesame, lemon, honey and cayenne into something I could seriously drink straight from the blender jar. 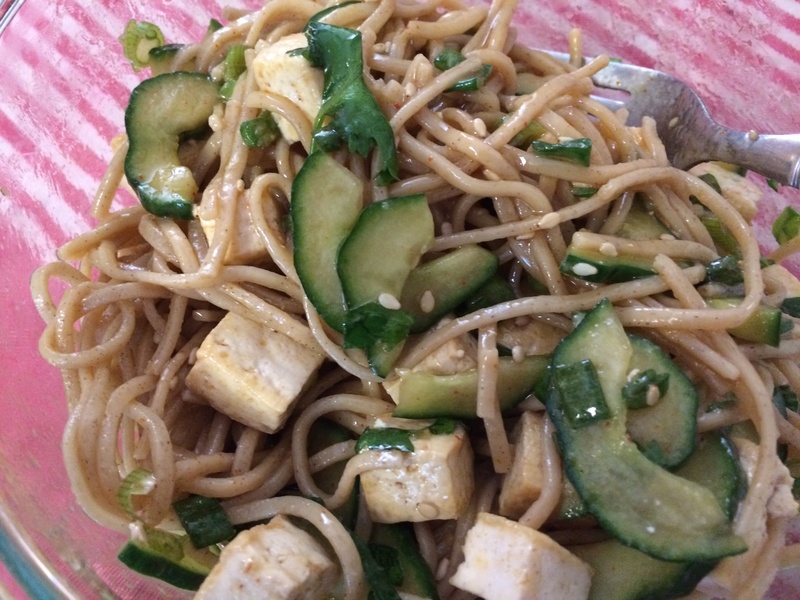 This gets tossed with some silky soba noodles (buckwheat, so good for you), a little tofu (although I promise to look the other way if you wanted to sub this out with some other, more meaty, proteins), and a pile of crunchy sliced cucumbers and green onions. Otsu came my way by pure serendipity. I had eaten it for years at one of our standby little hole-in-the-wall cozy neighborhood restaurants in San Francisco called Pomelo. The owner has a diverse palate and a quirky sensibility, and the menu brings together food from all over the globe without pretending to be anything fancy or cutting edge. Most of the dishes are comforting and delicious – exactly what you want on a weeknight or any night. Otsu was my favorite thing on their menu, a Japanese-inspired plate of awesomeness, that I never imagined I could make at home, there just seemed to be so many layers to the sauce. And then, all of a sudden, there it was on one of my blog’s RSS feed, in black and white, sounding and looking just like the real deal. It turns out the recipe had been published in a local food magazine and my life hasn’t been the same since. Try it once, and you will see what I mean. Cook the soba in plenty of rapidly boiling salted water just until tender, then drain and rinse under cold running water. 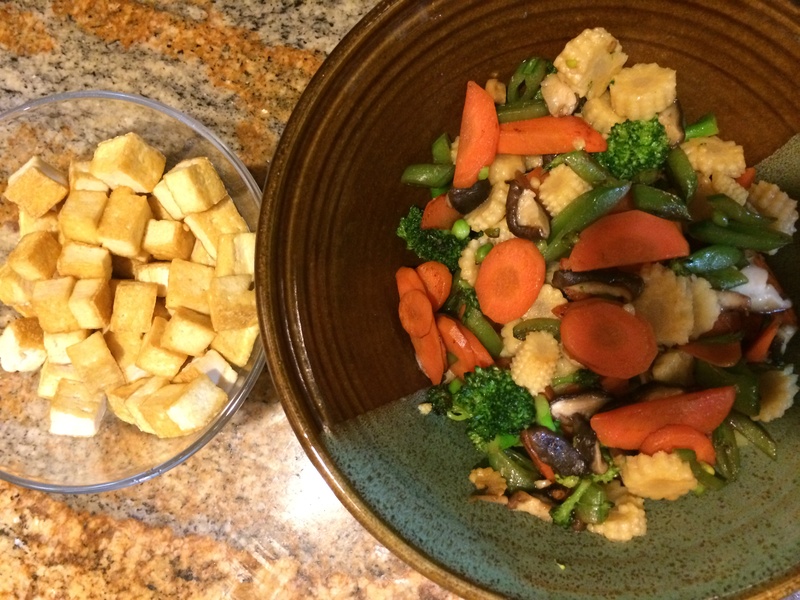 While the noodles are cooking, drain the tofu (I place it between paper towels with a weight on top to help the liquid drain more quickly) and cut it into 1/2 inch cubes. Cook the tofu in a nonstick skillet over medium-high heat with just a little oil for a few minutes, until the pieces are browned on one side. Toss gently once or twice, then continue cooking for a couple more minutes until golden. Season lightly with salt. 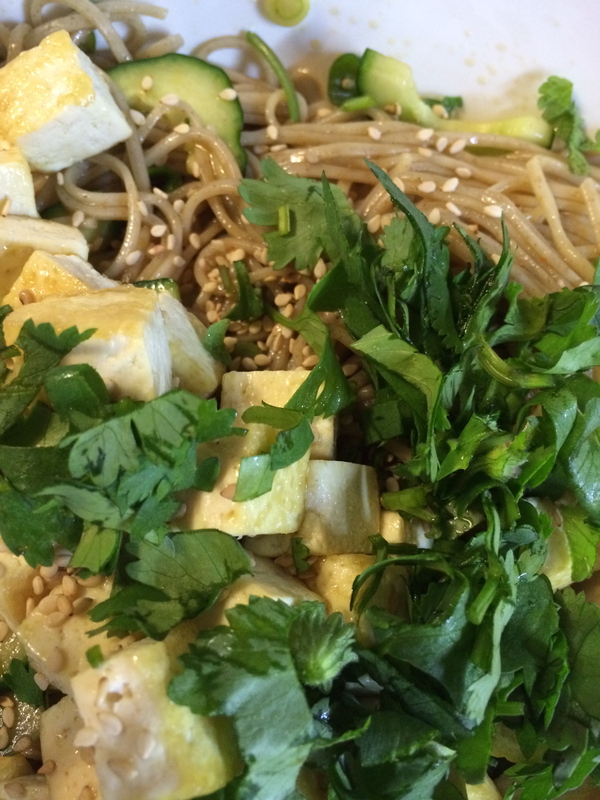 In a large mixing bowl, combine the soba, the ¼ cup cilantro, the green onions, cucumber, and about ⅔ cup of the dressing. Toss until well combined. Add the tofu and toss again. Serve garnished with toasted sesame seeds. Growing up, one of the best after-school treats was Maggi noodles. Anyone who lives in India or has spent any extended period of time there knows exactly what I mean. Ready in 2 minutes, it was instant ramen noodle nirvana, combined with the crack in a packet dubious mix of ingredients that came in the accompanying “masala” seasoning packet. 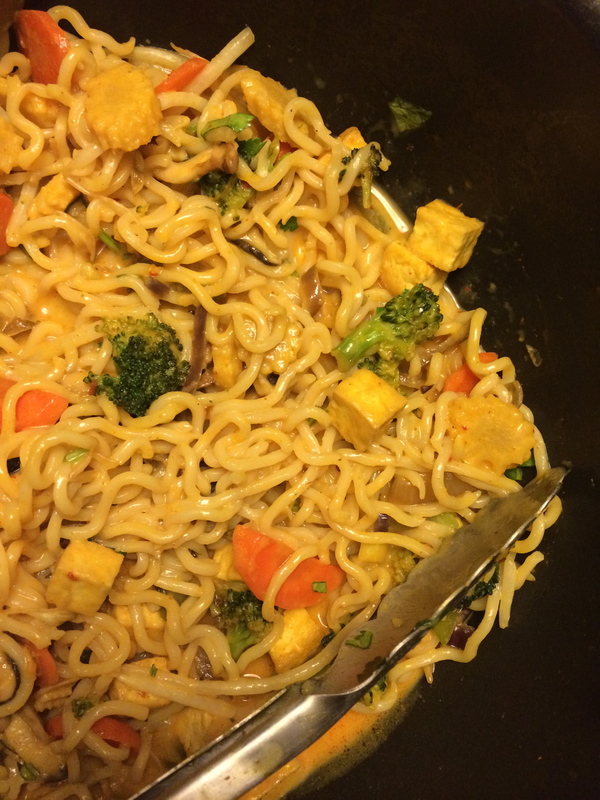 My mother was always suspicious of Maggi noodles, and only allowed it as an occasional snack, and always tried to health it up with some chopped vegetables. Ha! These bright little yellow packages of Maggi are dangerous – I’ve been known to sneak one into my basket at the Indian grocery store now and then, and feel almost guilty when I eat them. This Burmese khao soi is like a grown up version of Maggi noodles. Which means, some of you are probably rushing to the stove to make it right now! It takes a little more time, has a longish looking ingredient list, but is significantly better for you. This recipe also allowed me to legitimately use curry powder, which is one of those spices available in this country that’s supposed to be Indian, but certainly tastes like no masala powder I’ve heard of. I added the vegetables I love, and the entire thing soaks in the delicious sauce that makes your whole house smell amazing. 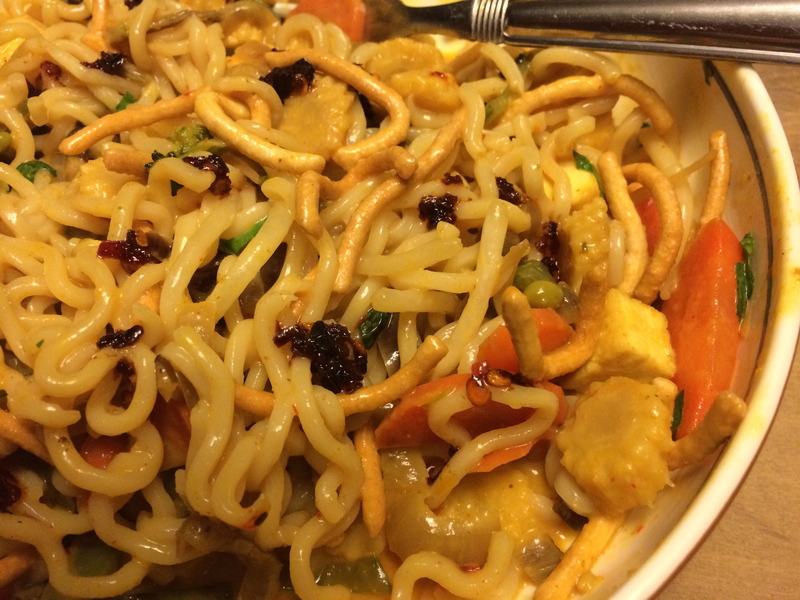 And because I love the play of textures, I topped each bowl with crispy fried chow mein noodles. I think with this, I have finally come up with a reasonable alternative to waiting two hours outside our favorite Burmese restaurant in San Francisco. Or something. In a large sauté pan, heat 2 tbsp oil and slowly cook the onions, garlic and ginger over medium heat, about 10 minutes. Meanwhile, prepare your tofu and vegetables. In a medium skillet, heat 1 tbsp oil over high heat. Once the pan is nice and hot, add the cubed tofu. It should sizzle once it hits the pan. Add a sprinkling of salt, toss and cook until golden brown, about 5 minutes. Remove from the pan and wipe down the pan if needed. Add the remaining tbsp oil and lower the heat just a little. Add the carrots, broccoli, and sugar snap peas and sauté for a few minutes to brown them, then add a touch of water and cover to steam them a little and cook them faster. Then add the mushrooms and salt to taste and cook until tender. Add the baby corn. Remove from the pan and keep warm. Once your onion mixture begins to get soft and caramelized, add red curry paste, curry powder, turmeric, coriander powder, and chili powder. Cook for a minute or so. Add the coconut milk, water, brown sugar, and salt. Simmer over medium heat until the sauce thickens slightly, 5-7 minutes. Cook your noodles according to the package directions. If you want some fried noodles too, deep fry them until crispy and drain on paper towels. To serve, put noodles in a bowl, add vegetables and tofu, top with curry sauce, mung bean sprouts, fried noodles, cilantro, and green onions. Toss to combine. We also topped ours with our favorite chili garlic oil.